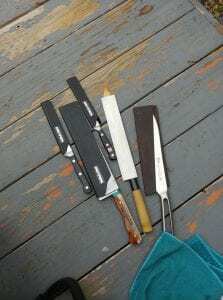 Home » Blog » Food » Chef Knives: What Do The Professionals Use? 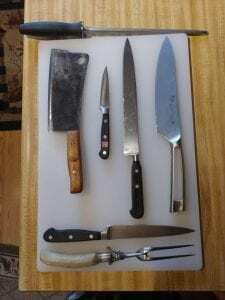 Chef Knives: What Do The Professionals Use? What are these professionals using? Which knife brands should I be looking at? While we all love a celebrity chef, let’s consider the local professionals that work hard to bring quality to your plate, whether you used a delivery method to eat at home, or you are dining in, you matter. In the same breath, the quality of their tools matter, it is easy to understand that a sharp knife makes everything easier, and different brands bring different qualities to the table. A chef can become so attached to one specific knife that it is almost like an extension of his being. While this has no doubt been said so many times over the years that it almost comes off as a cliché, there is still some level of truth here. When asked about why chefs prefer specific knives, it is no surprise they couldn’t give an in depth answer; seeing as I was at work during the times I was talking to these individuals, they would look at their knife, and you could see a part of them melt a little. They would pick up the knife, consider the blade, the handle, the weight, the minute details then give me the basic answer: I don’t know, it just works for me. So, with that, is it possible the connection to these knives is more subconscious than anything? Definitely. Aside from the immediate attraction that could come from the brand, the materials used to make the knife, style of the knife, etc, I have no doubt chefs are attracted to their tools on a subconscious level, even I have been subject to this connection to my tools. From here we will go through a few of the chefs I have met in the industry and which knife is their favorite, maybe this will give you ideas for the coming holiday, and if so, I suggest you check out SparrowHawk Gourmet Cookware; Allen works hard to ensure his customers are taken care of properly, he takes pride in his work, and he stocks quality products in his local shop on Tejon. The following was sent to me by Jamie Dahlin, we worked together for a good amount of time at the vegan restaurant Moxie, and while he is currently out of state until next winter working as the head chef at Mr. Helsinki Wine Bar and Art Gallery in Door County Wisconsin, he went out of his way to comment for us. “Obviously you know lol… I prefer the Zwilling Pro line from J.A. Henckels. Very similar to Wusthof, this line is made of forged German steel (though both companies were founded before Germany was even a country). With a hardness rating just one point below Wusthof I find both to stay sharp about 3 days in the kitchen. Though Zwilling is easier to sharpen and hone to the desired angle. Also, the handle is designed almost flawlessly. With the bolster curving from the handle into the blade instead of using clunky right angles. It truly makes the knife feel like an extension of your arm.” His comment on the curve of the bolster is referring to what is called a “recessed bolster”, to fully understand what this means I would suggest anyone check it out on the internet or go to your local cutlery shop to identify the different bolster styles between multiple brands. When pinching the blade, it is almost an immediate deal breaker whether you like the bolster of a knife or not, seeing as professionals no doubt use their chosen knives for a minimum of 4 hours a day it is a given that the handle has to fit like a glove. Which goes into what Jeremiah Gray, sous chef at Moxie, mentioned when talking to me about his Wusthof Legende Chef’s knife: “With the chef’s knife being the most essential tool, I found it important to find a knife that fits my hand but also my style and personality.” And that goes back to the initial remark of being subconsciously attracted to a knife beyond the immediate details you see with your eyes and feel with your hands. In my personal and professional lives alike, I use the knives made by Cangshan Cutlery Allen mentioned, not just because they are aesthetically pleasing, but also because of the weight, feel, and type of steel. I have tested a number of different brands in the last couple years ranging from Wusthof to Shun to Global, Dalstrong, and so on, but the Cangshan knives really work for me. 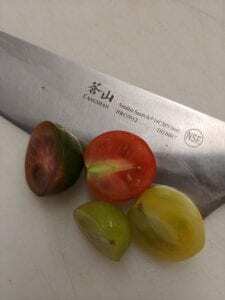 I have a muscular deficiency that I have been dealing with since birth, and there is no doubt it can affect my efficiency in the kitchen, even when handling a knife it can be bothersome because if the knife is too light I feel like I lack control; that being said, the Cangshan knives I use, the TN-1 series specifically, have a weight (11.4 oz) that works perfectly for me, and the shape of the handle conforms into my hand, so given both aspects I feel like I have more control. Unlike Zwilling, Wusthof, and Messermeister (German Steel), and the Shun (Japanese Steel), Cangshan knives are manufactured with a Swedish steel at a HRC of 58 to 61- and the Rockwell scale is a whole other aspect to consider when shopping for your own knives. Once you understand the steel and hardness of the knives you use, it can make it easier to shop for other products in the future if you decide to branch out and try different brands. German knives like the Wusthof, Zwilling, and Messermeister are made of a softer steel (56 to 58 HRC) as opposed to the Cangshan (59 to 61 HRC) and Shun knives (60 to 62 HRC); while a softer metal sounds concerning it definitely has its benefits over the harder steel knives, and in such respect some projects require different knives. For example, you wouldn’t want to try to separate the bones of a chicken with a Japanese knife because the blade is prone to chipping due to the hardness of the steel, while a German steel knife is perfect for butchering due to the softer metal and traditionally thicker blade; in the same breath, a Japanese knife is better than a German knife when it comes to precise cuts like Sushi or any projects that require a finer/clean cut. Not to say you can’t use a German knife for this kind of project, but the hardness of a Japanese blade yields a sharper edge, so it would produce a better result. That is where the Cangshan knives come in with their Swedish steel; the company does have German steel products, but they plan to switch all knife lines they make to the Swedish steel as they believe it is a better steel. Swedish steel, in my experience, is like the perfect middle ground between German and Japanese steels as you can abuse it like a Zwilling knife but retains an edge almost like a Shun. Next is to consider the manufacturing methods. Some companies have more budget oriented lines of knives that are made from stamped steel, this knife comes from a giant roll of metal sheets, they follow with a stamp of the knife and punch the sheets to create the shape of the blade, after that it is heat treated, sharpened, polished and given their handles; this does not mean they are inferior knives, they are designed to save the company and the consumer money in the long run. While that is all good and whatnot, these knifes are less sturdy as their forged or folded counterparts, and do not hold an edge as long either. A couple examples of this are Victorinox Fibrox and the Wusthof Pro lines; great knives for the price but really depend on what you would be using them for. Forged knives are a definite step up, and if properly taken care of your grand-kids will be using your knives, which is not an exaggeration seeing as I have a carbon steel chef knife that was forged in the early 1900s; forged knives are one of the oldest ways of making a knife as you forge the knife from a block of metal using extremely high heat, mechanized hammers (in the current age, of course) and so on. A few examples of forged knives are the Cangshan TN-1, Wusthof classic, and the Zwilling Four Star/ Pro lines. The last one is folded steel, this method is typically used when making knives such as the Miyabi Kaizen line which is run by Zwilling, or the Shun Classic run by- well- Shun Cutlery. This utilizes dozens of layers of steel that are heated and repeatedly folded over until the goal has been reached, and this definitely contributes to the hardness of the steel. In the end, it does come down to what you are looking for in a chef knife considering the metal, handle material/shape, weight, length and so on; so while the typical answer is for you to go out and find knives that work best for you, it does help to know what some of your local professionals use in their kitchens. I would like to take a second to thank everyone who contributed to this article! 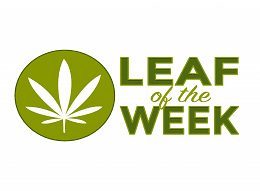 Cailean has lived in Colorado his entire life, a 22 year old young man located in the heart of Colorado Springs. He has worked as a freelance writer for clients around the United States, and took the initiative to get first hand experience “behind the scenes” of the culinary industry here in Colorado; at the age of 5 he was reading college level books, and had already begun writing his own stories. In his free time he can be found exploring the state of Colorado, playing music with friends, or continuing to gather knowledge of the local culinary industry, it can be mentioned by his friends and family that he never really stops working- his mind always goes back to the same thing: stories. There are so many stories around Colorado that he wants to bring right to your fingertips.